Organise and manage your buildings and physical resources using Invotra Locations directory. Contact details can be created as links, allowing users to directly connect to all of your locations. Keep track of resources contained in a location, including teams and people based at the location. Easy to use, targeted search to ensure all users can find the location details they need. Invotra’s Location directory allows users to view all the locations in an organisation, and to see the people and teams who work there. Each location has its own page, with the ability to add an image or map, links for contact details and a free text area for any other important information about the location. With a locations landing page and search page, identifying locations is made simple. All location search results display the address and contact details of a location, links to allow users to directly contact all colleagues within a location, and the skills and teams of the people who work in each location. 1. 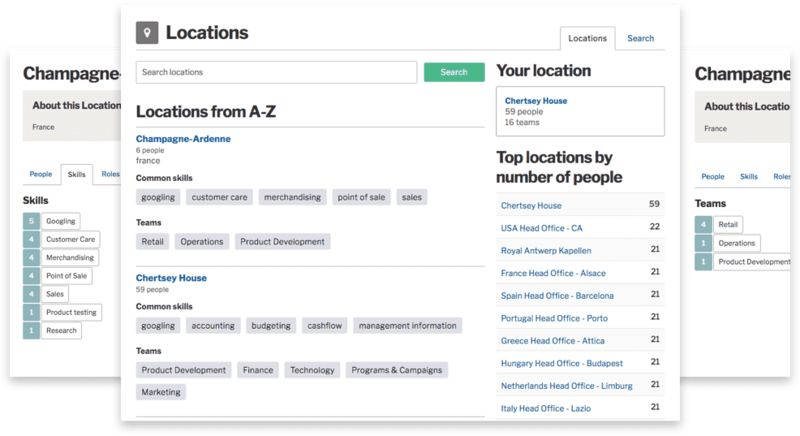 Location contacts – Contact details are clearly displayed, in search results and on the full location directory page, and can be added as links to allow users to directly contact all colleagues in that location. 2. Add images and maps – To help other users identify and find a location, maps and photos of locations can be added. 3. Locate resources – Location pages contain details about all of the employees in the location and their roles, skills and teams, to enable organisations to view the spread of resources across locations. 4. Compatible with most existing HR systems – Invotra allows simple transfers of existing locations data to your Invotra Locations. 5. Search – All location data is fully searchable. If required, searches can also be customised by site managers to only display required information.